At the Fakuma fairground, Arburg is using an automotive application to present the physical foaming of glass-fibre-reinforced thermoplastics (GFRT), demonstrating the new innovative Profoam foaming technique that enables lightweight, resilient and low-distortion parts to be injection molded with a homogeneous foam structure. A kinematic housing for use in a car interior is produced by a hydraulic Allrounder 630 S with a clamping force of 2,500 kN and a size 1300 injection unit. The cycle time for the part, which is produced from PC with 20% glass fibre, is around 65 seconds. At 361 grams, the foamed housing is around 13 percent lighter than a similar compact injection molded part and thus requires significantly less material. According to Arburg, it has collaborated with the Institute for Plastics Processing (IKV) in Aachen, Germany, on the research and development of the Profoam physical foaming process. The process is characterized by a simple process sequence. The plastic granules are first mixed with liquid propellent in a granulate lock between the refill container and material feed. 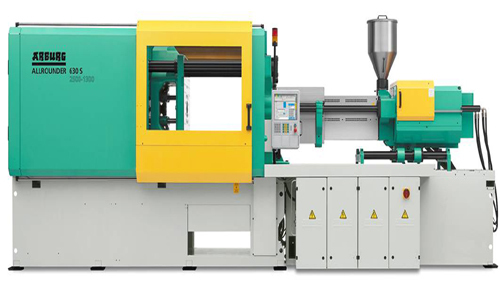 The injection molding machine can flexibly be used for other applications, enabling compact parts to be produced without requiring set-up work. As introduced, fibre-reinforced plastics are processed without additional shearing. An injection unit featuring a normal three-zone screw geometry is used. During the plasticizing process, the propellant is dissolved in the melt and only emerges again in the form of micro-cellular “bubbles” when the pressure is reduced during injection. Foamed parts with glass-fibre reinforcement can be produced particularly effectively, achieving better mechanical properties. When these types of materials are used, Profoam generally produces a longer average glass-fibre length in the part than in the case of conventional compact injection molding. Depending on the material, the surface quality can be improved by means of variotherm process control.